Thanks to a gchat with a friend of mine, I found an old blog. It wasn’t so long ago that I wrote my last entry for that blog. That old virtual rant of mine lasted from January 2005 to February 2008. Despite that, I couldn’t remember the name of it without the help of my friend, Kristin. I started reading it, ended up spending copious amounts of time copying it into Pages, and am now reading through it, delighting in my old self. I will recognize this as an incredible bit of navel-gazing, but what can I say, I like that me. And I’m quite interested in how in a year and a half I can become someone so different. So I took a look at an entry I wrote before I left for a summer in Kolkata and then went searching for a picture of myself at that time. Not much to look at at first, I know. But what about all that long hair, blonde hair. 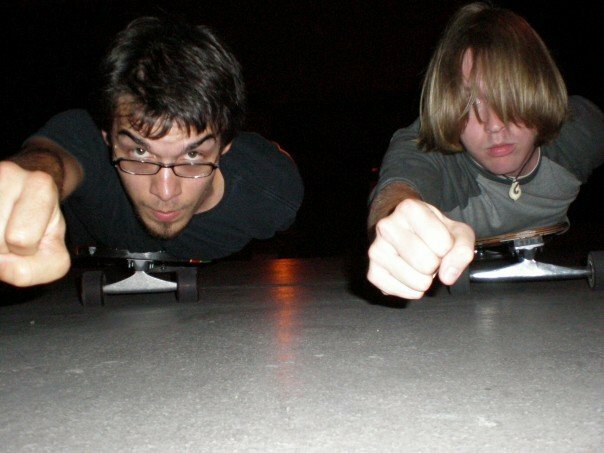 This was taken the night before I left Abilene for Kolkata, moments before my friend and I rode those longboards down the sharp slopes of parking garage levels, bellies to grip tape, fists forward, eyes watching the approaching wall and the slick cement in our periphery that slid rapidly up under our chins. I can remember the first drop, the fear of turning, the smooth surface on the palms of my hands as I used them, along with the toes of my shoes, to brake. I’m watching the Wild Turkey Bourbon National Turkey Call Championship. I’m imagining how this guy got on TV to screech and bob right before the commercial break. Somewhere, sometime, someone told this guy that he did a good ‘turkey’. He used it a couple times out in the woods hunting. Couldn’t ever tell if it worked. Then he was at a convention and saw a Turkey call contest flier. Entered. Won. Went online to ‘just see’ if there were other contests. Entered more. Then, at one of the big ones, some representative that sold deer urine or tree stands told them they’d sponsor him at nationals. So here he is now, reaching back in his lungs, contorting the back of his tongue and squeezing air out in short bursts as he bobs up and down as if to convince us further that he can be very turkey like. I watched The Sandlot last night. I wish we all could grow up like that. Wendy-Preffercorn-summer-swims- L-7-weenie-baseball-carnival-campout-best-friends-versus-the-beast type childhoods. I love that movie. My mom said something about how kids used to be able to run around town like that by themselves. It’s true. And sad. I would leave two days later for Kolkata. I think perhaps I didn’t know how to write about what I was feeling then, about what I would see. I didn’t blog again until the summer was over, and then the entry is merely a list of summations, small blips about a summer to large for my heart to take. Even now I’m not sure how to write about that summer, about the tiny slum school, the stench of dung cakes used to cook dinner, the constant heat, the sway of train rides where strangers mashed up so close that their sweat mingled with mine. And I would learn that summer about the way so many millions of people spend their childhood summers, in slums so far away from Sandlot kinds of Junes and Julys, that such things as smores, baseball games, carnivals and swimming pools are simply unimaginable. In those few days in June maybe I was more brave. Or maybe I had no idea what I was getting into. Is it mostly to do with food? Very likely. That’s why I love keeping blogs and rejoice in starting new ones: it’s very interesting to reread them later and look at your past self. It’s really helped me put a perspective on things. Such as: the heart-breaking pain of a failed relationship seemed so endless at the time, but rereading those journal entries, I realize how far I’ve come. How that pain was temporary. It was, in a way, a final closing to some sort of healing process. It’s validation: that was temporary.